Air Fryer Onion Rings are extra crispy and make a perfect game day snack or party appetizer. 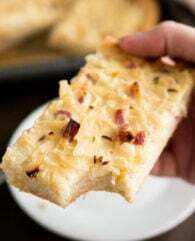 Perfectly seasoned, easy to make, and so delicious! 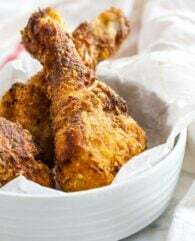 Ditch the deep fryer in favor of this quick Air Fryer recipe! 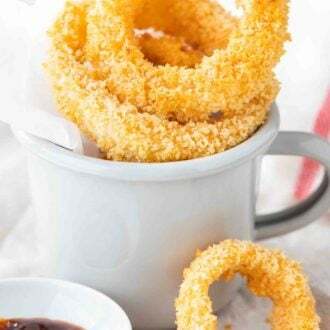 Crispy Air Fryer Onion Rings are perfectly seasoned, dipped in batter, dredged in panko breadcrumbs and then cooked to crispy-perfection in the Air Fryer! These faux-fried onion rings are tender on the inside and so crisp on the outside, just how we love them. 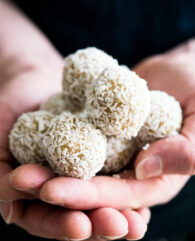 They make a great healthier but so delicious snack or side dish. 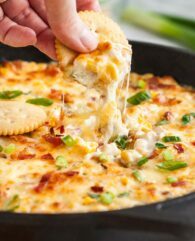 Serve them up with your favorite dipping sauce for the perfect party appetizer or game day snack! 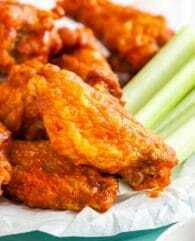 We love making our favorite game day snacks in the Air Fryer like Air Fryer Chicken Wings, Air Fryer Chicken Tenders, and Air Fryer French Fries. Compared to deep frying you save a lot of oil, have a lot less mess to clean up, and save a good amount of calories. 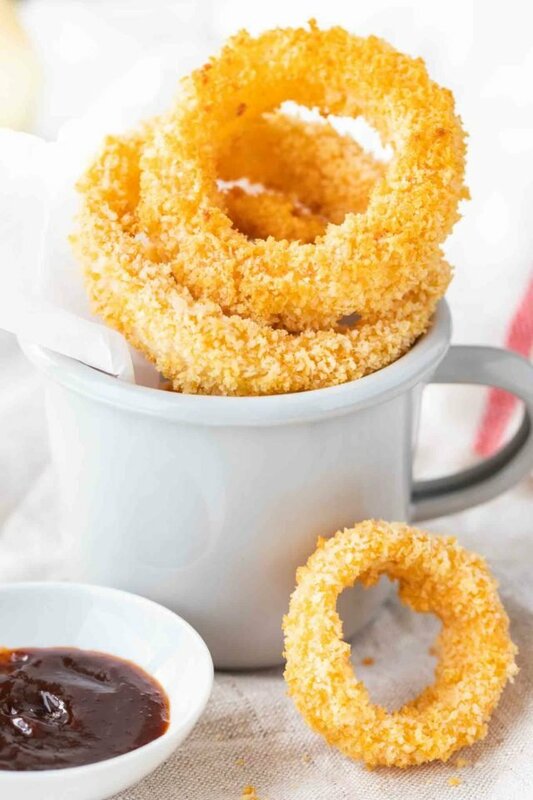 You only need a few tablespoons of oil to get similar results in the Air Fryer, which makes eating onion rings made in the Air Fryer a better-for-you choice than eating onion rings that have been deep fried. My husband loves onion rings and orders them whenever we go out. He was amazed by how similar my homemade version tastes and how simple it is to make them. So if you’re craving Onion Rings you have to try this easy recipe! Using panko breadcrumbs makes these Onion Rings extra crispy! 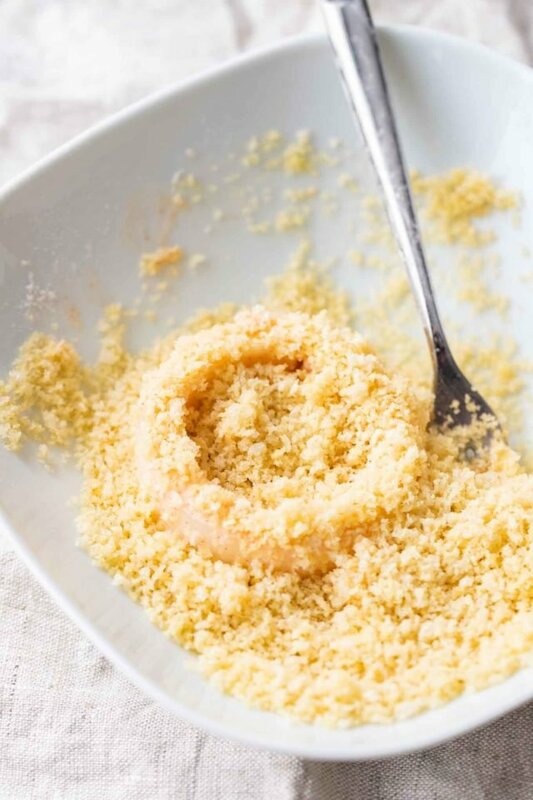 If you don’t have panko breadcrumbs you could also use normal breadcrumbs but the result might not be as crispy. Divide the panko breadcrumb mixture in two. The battered rings will make the mixture sticky so it’s best to half it so you can switch to the second part of the dry mixture after the first part is sticky. Instead of paprika, you can also add your favorite spices like a bit of garlic powder, cayenne pepper, or chili. so I can add a second layer, this way I can fry a whole onion at once even though my Air Fryer is quite small. The cook time depends on your Air Fryer model. The onion rings take about 12-15 minutes but some models run hotter or colder so keep an eye on your first batch. Spraying the onion rings with cooking oil spray after half the cook time is over makes them extra crispy and browner. You don’t need to turn the onion rings during the cooking process! It’s just not necessary, they will get perfectly crispy on both sides. 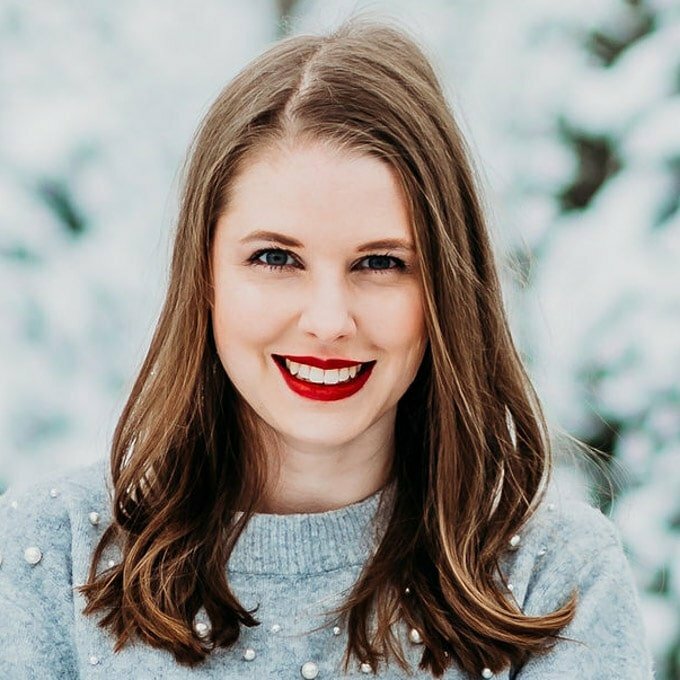 Depending on your Air Fryer model you might have to preheat it. Mine doesn’t require preheating! How thick to slice Onion Rings? I cut them into 1/2-inch thick slices and then separate them into rings. Which Onions are Best for making Onion Rings? Sweet onions like Vidalia, Texas, Maui, or Walla Walla are best for Onion Rings since they’re sweet and usually flatter than other onions. They don’t have that sharp and pungent taste that other onions have. How long to cook Onion Rings in an Air Fryer? Depending on your Air Fryer model about 12-15 minutes until they are golden brown. 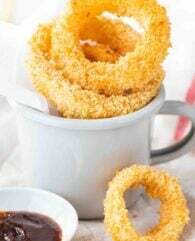 Want to try this Air Fried Onion Rings recipe? 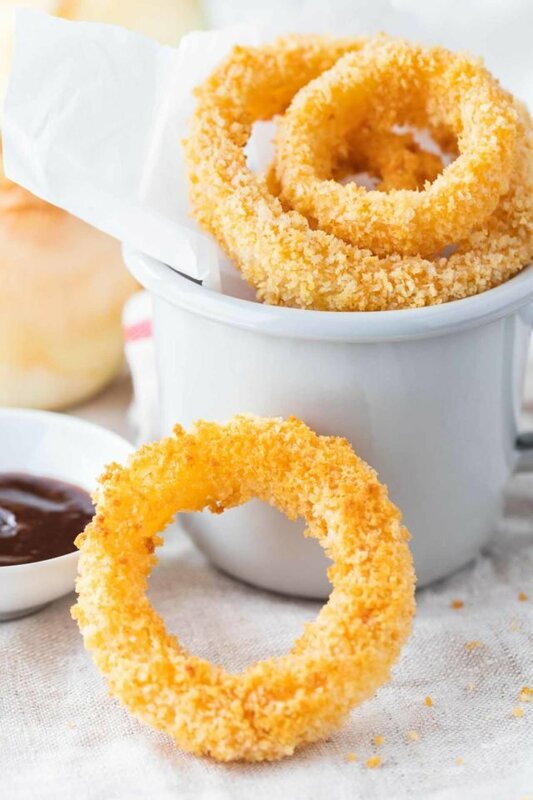 Air Fryer Onion Rings are extra crispy and make a perfect game day snack or party appetizer. You need three shallow bowls or deep plates. In the first one combine flour, paprika, and ½ tsp salt. In the second combine buttermilk (or milk and vinegar/lemon juice) and egg, then add ¼ cup of the flour mixture from the first bowl. 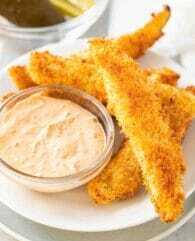 In the third combine panko breadcrumbs, ½ tsp salt and olive oil with a fork until the oil is evenly distributed. Dredge the onion rings in the flour mixture, drop them in the buttermilk mixture and then dredge them in the panko mixture. 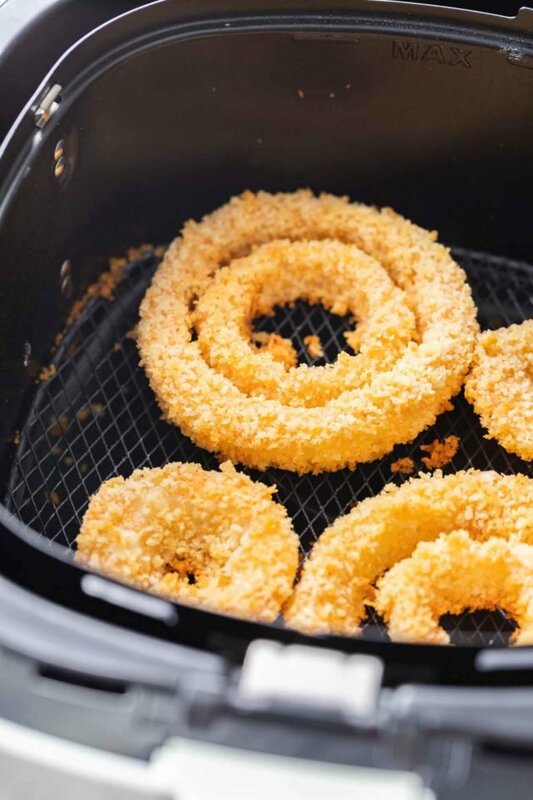 Place onion rings in a single layer in the Air Fryer basket. You can place smaller rings inside bigger rings if necessary, just make sure there is space between them. Cook at 400°F until golden brown and crispy, about 12-15 minutes. Spray with some cooking spray after about 6 minutes. These look incredible! My husband loves onion rings. I can’t wait to test them out in the air fryer. I struggle with my air fryer…it just doesn’t get things crispy. Hoping your tips will help :-).